Synopsis: During a manned mission to Mars, Astronaut Mark Watney (Matt Damon) is presumed dead after a fierce storm and left behind by his crew. But Watney has survived and finds himself stranded and alone on the hostile planet. With only meager supplies, he must draw upon his ingenuity, wit and spirit to subsist and find a way to signal to Earth that he is alive. Millions of miles away, NASA and a team of international scientists work tirelessly to bring “the Martian” home, while his crewmates concurrently plot a daring, if not impossible rescue mission. As these stories of incredible bravery unfold, the world comes together to root for Watney’s safe return. 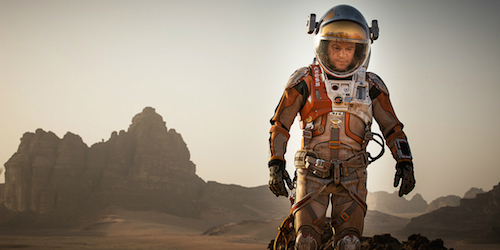 Andy Weir’s “The Martian” is not an easy book to adapt for the screen. First person narration aside, the method in which Weir presents the main character Mark Watney is done with such perfection, from each and every sarcastic remark, hilarious anecdote, self deprecating moment, and the emotional ones sprinkled in-between, that his character creates a bond with the reader that is uniquely special. 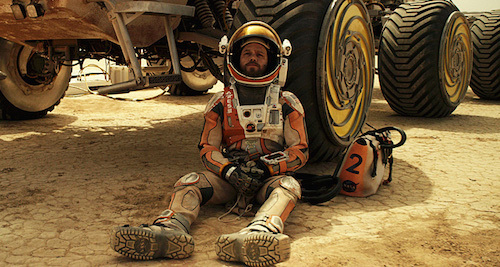 Transferring that attachment to an on-screen character would require a grand imagination to set the scene, a performance by the actor in the lead role that manages to connect immediately with the viewer, and a script that evokes the same tone of the book where you are at once laughing, crying, and just like Watney, hating Mars. It also needs to keep with the idea that science is key, and make it understandable. The Martian does not manage to do any of these things well, but it’s still a decent movie–if you’ve not read the book. Mark Watney is part of a team of six astronauts who are on Mars for a mission. They are tasked with the basics of space travel when based in the present time and the actual world we live in. The Martian is not meant to be a science fiction film where suspension of disbelief must occur with time and place because we know it is possible in the coming years that we could go to Mars. There are also no aliens running around or ominous presences that may swallow Watney whole at any moment. The antagonist in The Martian is mother nature, on Mars, and she sure packs a punch. One could argue it is also technology, but that must be reserved for another day. While the crew is outside their base camp, so to speak, a storm hits that surpasses the limitations of their ship and they have to abort the mission early. It is a long trek back to the ship in a mean storm when Watney is hit by debris and cast out into the Mars wasteland. All vital signs are lost, and he cannot be seen by the other crew or by using any technological means. The mission captain has to make the difficult decision to leave Watney behind. It is the logical choice as all signs point to him being dead. Watney isn’t dead, but he may soon be if he can’t figure out a way to stay alive for the next four years until another ship lands on Mars. That is where the fun begins; or where it should have begun if you read the book. Instead, The Martian sidesteps the need to anchor the movie on one man and his first person narration of his story, with the inclusion of his crew and NASA down the line. The Martian is no more than a space rescue mission movie that has been done in a variety of ways before. It is not the character piece that was presented in the book, or a deeply funny story about a man struggling to survive on Mars alone, while pillaging entertainment from his crewmates and judging them in the most hilarious fashion. The things you do to keep yourself sane while having absolutely no communication with another living person is interesting. The Martian does not try that angle. It goes for the easy way out: Man stranded on Mars, NASA to the rescue. The exclusion of much of the profanity present in the book also hurts the film because as you get to know Watney you know that one word can say a great deal. In the film, those moments did not make the cut. Nor did creating a character who is self-sufficient beyond botany and simple chemistry. Dumbing down Watney does not help the viewer connect with him, it simply makes for a simplistic version of a generic story. What made Watney great in the novel was the way he managed to do the impossible, and we, as readers, got to follow along with him and feel like we, too, were on Mars. The Martian keeps you locked up safely in the control room back on Earth. The Martian could be cut-up and all of its faults when compared to the book described in detail in thousands of words. The reality is, not many people will care who go to see the film. They’ll want a good, enjoyable movie about a man stranded on Mars, and The Martian provides as much. The cast of characters are all servicable in their respective roles, Mars looks as good as a barren red planet can and should, and if you like Matt Damon then you won’t mind the lack of charisma he has as Watney. If you were expecting lots of special effects and space awesomeness, you’re in the wrong place; The Martian is not that movie. Keep in mind though that you will be doing yourself a disservice should you choose to not read the book. For those who have, it is highly suggested you stick with your own imagination and read the book again instead of seeing the film. Screenwriter Drew Goddard chose to focus more on NASA than developing Watney’s character, and establishing the bond between him and the viewer, as the book did with the reader. Focusing on what is happening at NASA is always entertaining, if you don’t know any better. Readers of “The Martian” know better. Instead of having Watney describe his ideas, lay out his plans, or reenact them for you, The Martian relies on montages to show what he is doing, without displaying the ups and downs and turmoil that comes with his mistakes and accomplishments. The Martian over-simplifies everything, and nearly makes it look like surviving on Mars is an easy thing to do. It’s not. Reading the section of the book that deals with the solar panels will tell you as much, while the movie completely disregards that plot point as being important. It is very important for what it says about Watney, his emotional strain and abilities, and his need to survive. That is only one of many overlooked parts of the book that did not make the movie. What if you have not read the book, you ask? Then as long as you like montages and very little scientific explanation you’ll be just fine with the presentation of The Martian. And, if you do not expect to actually care about Watney. The ending does manage to give you the feeling of hope, unity, and heroism one comes to expect from a rescue mission film. Perhaps it is because of China’s involvement, or the camaraderie of the crew, or Watney himself relinquishing all of his power to other people who have no idea exactly what he has gone through. Then again, neither does the viewer because montage only gets you so far and seeing the depleting weight of a man only presents a superficial analysis of his state. Emotional depth of character has been stripped away in The Martian, leaving a troubling feeling that the movie was made to satisfy the masses, not the dedicated fans who Googled their way through the book testing the science every step along the way. Matt Damon is not the Mark Watney readers deserve. There is an overall blandness to his character that is painful to watch when he delivers key lines drawn from the book. The sparkle one imagined coming from Watney does not emanate from Damon. He appears unable to grasp the character’s humor, sarcasm, and overall tone when reciting his journal entries. He takes everything far too serious, and while it is a very serious dilemma he is dealing with, Weir wrote a character that embraced the ironic twists, and managed to say “Space Pirate” on paper in a way that echoed in your head and forced a laugh to escape your mouth. In the film it does not even manage to create a one-off chuckle as the boredom seeping out of Watney’s eyes is just downright depressing. While watching The Martian you cannot help but imagine what it would have been like if an actor who could deliver a line with sarcastic wit and a better temperament had taken the role instead of Damon. That there is the ultimate failure.